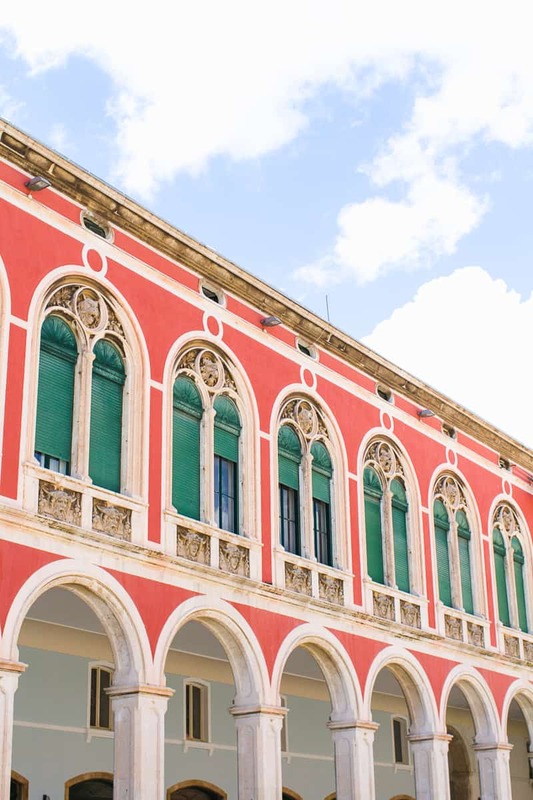 I can’t believe it’s been over two weeks since I came back from Croatia, I spent a week in this beautiful country and ticked a couple of places of my ‘to see’ list whilst I was there! If you’re planning a trip here anytime soon, or maybe you’re thinking of visiting Croatia for your honeymoon or are simply dreaming up new pretty place to explore in the future then be sure to pin this page to your travel board for future use! I’m going to be sharing places to visit, where we stayed, what to eat, my favourite moments and a few helpful tips and tricks! Hands down my favourite day of the whole trip was when we took a day trip to Krka national park. This park is full of these insanely gorgeous natural waterfalls that you can gawk over! (Actually if you go in the summer months you can swim in them!) we booked our tour with a company called Splitlicious and I couldn’t recommend them enough! We got picked up in a mini bus around 8am in the morning and headed to Krka, it takes about 40 minutes to walk around the entire park and there’s a lovely little restaurant that over looks the waterfalls where we ate lunch. Once we left Krka our trip also included a stop at a sweet little town called Sibenik, if you happen to go here make sure you try the white Nutella ice cream from the ice cream shop down on the front promenade! It was incredible! Everywhere you look in Split there are posters saying ‘visit the blue cave’ which is this natural cave where the water is illuminated bright blue from the sun, but the entire cave is pitch black so it’s kind of like this cool neon effect inside! We decided to do this trip one day but in all honesty were a little dissapointed! It took us 2 hours on a speed boat to get to the blue cave and we were in the cave for all of 5 minutes. There were other island stops after the blue cave including Hvar but my sister suffers with her joints and muscles and after spending almost 5 hours in total on this speed boat she was in a lot of pain by the end of the day! So I wouldn’t recommend this at all to anyone who has a bad back, joint issues, etc. It’s just not worth it. What I would recommend though is climbing the bell tower in Split! I have to be honest, I’m a little scared of heights and I did feel quite uneasy at times on the steps but the view from the top of the tower overlooking all of the palace really was beautiful! We also climbed the bell towel whilst we were in Zadar, that one wasn’t scary at all, it had huge stone steps with plenty of room to manoeuvre and the views were again, incredible! Whilst in Zadar you also have to go check out the sea organ! It is insanely cool. Basically the sea organ is this experimental musical instrument, which plays music by way of sea waves and tubes located underneath the marble steps. It’s incredible, so definitely just relax here for a while and listen to the tunes of the ocean! I would recommend having dinner at Tramonto in Zadar and watching the sunset there, the views were beautiful and as Alfred Hitchcock said “”Zadar has the most beautiful sunset in the world” Then walk on up to the ‘Sun Salutation’ which is also right by the sea organ, here you’ll be greeted with a fantastic and fun light show all solar powered! The lights flicker and change all the time creating new patterns and it’s a fab photo opportunity! We used air b&b for both parts of our trip, in Zadar we stayed here and just booked a room which was great for us, the location was super central too! We then got the bus to Split (which took just under 4 hours because it takes quite a scenic route with a lot of stops!) and stayed in this beautiful apartment! We were told it was about a 10 minute walk from the palace (the centre of where everything is) but in realty it’s more like 25 minutes away. The best thing to do when researching where to stay is using the Gregory of Nin statue as your central point and working out how far away your hotel or apartment would be from there because that statue is pretty much right in the middle of the city! We ate some super delicious food whilst we were in Croatia, it’s worth knowing that most restaurants will bring you a bunch of bread with olive oil and vinegar to start too! In Zadar our favourite restaurants were Tramonto and Fosa, the first one overlooks the beautiful sunset and has a huge variety on the menu, all super reasonably priced too! The second restaurant is a bit more fancy (the menus were actually on interactive tablets!) and overlooks a pretty harbour so if you’re looking for a nice, slightly posh dinner in Zadar then Fosa is for you! In Split, we were recommended the eat at Fife by several different people, this place is definitely one for the fish lovers! I also liked the casual dining of this restaurant, we were seated on a table of 4 with a couple from Scotland who were hilarious! While we were there it was my sister, Lydia’s birthday and since we love Mexican food so much we decided to visit Bistro Toc for her birthday lunch. The guacamole was incredible and so were the quesadillas! We also loved Toto’s Burger Bar, they had an incredible vegetarian burger and serve sweet potato fries too! The decor and staff in there were all awesome and it’s rated really highly on trip advisor! One night we decided to go out for cocktails and found this fun little bar called Sanctuary Bar! The cocktails worked out £3.20 each and they were big cocktails with generous amounts of alcohol in so you can imagine how much fun that night turned out to be! You have to get ice cream from Lukas! It’s known for being the best in Split and the flavours were amazing! Every day there was something different and my favourite as by far the pistachio flavoured ice cream! Get yourself a cone if you walk by! Don’t be fooled into thinking that the currency in Croatia is Euros, we were silly enough to assume this was the case until the day of our trip when we found out they actually use Kuna. We had to get our money at the airport and we were stung on how bad the exchange rate was! If you’re a coffee lover and like to drink big mugs of it, simply order a white coffee, these are the biggest mugs they do, all the rest of the coffees on the menus are almost espresso size. Make sure you pack comfy shoes because you’re most likely going to be doing a lot of walking! I was told before I left by a friend that lives in Croatia that Croatians are all about relaxing and enjoying their time in cafes and at lunch, so order yourself a coffee and spend a little time people watching and relaxing in a pretty cafe! Love this post! So much great information ? my husband and I are traveling to Croatia April/May this year & I was wondering if you could give some advice on what to pack? Was it warm? Or cold when you went? Thank you! Thank u 😊 …Its very Informative ! !